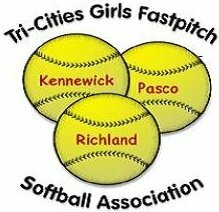 To volunteer for a coach position you must submit a Coach's application and Washington State Patrol background check form by mail (PO Box 1648 Richland, WA 99352) or submitted to any board member. All Head Coach positions require Board approval. Forms can be downloaded from the Forms page. Please pay particular attention to the requirements listed on the coach application. Coaches new to coaching with TCGFSA will be required to go through USA's ACE Certification Level I which covers fundamentals of coaching youth softball, team management, and how to encourage players to build confidence and develop as softball players. A coach can be certified using the online system found at USA Softball. Please print out your confirmation for passing the ACE certification to be reimbursed for the training fee. Coaches with ACE Certification from 2017 will not be required to go through this training in 2018. Head coaches need to commit to attending the majority (85%) of games and practices. This usually involves several practices per week until games begin, then 1-2 games per week with maybe a practice once a week as needed. Teams are limited to no more than 3 days a week for games/practices. Check the annual calendar for dates regarding the start of practices, start of pre-season jamboree games, start of regular season games, and post-season games. TCGFSA provides you with an USA rule manual, copy of the By-Laws, Scorebook, an equipment bag with catchers gear, bats, and batting helmets, and a bucket of softballs. These items may be picked up at the Coach Orientation meeting. Is there a League orientation? Each age league will have an orientation night to go over season expectations, receive copies of items described above, arrange practice fields and picking up equipment, and receive picture packets. Check the annual calendar for dates and times. Can I request players from last year? No. Coaches may not make player requests. However, parents may request their daughter to play on the same team as in the previous year. Every effort is made to accommodate team suggestions by parents, but TCGFSA is not always able to honor these requests. The requests are typically handled on a first-come-first-serve basis. When will I receive my team roster? Rosters should be available 5-7 days prior to the start of practices as indicated on the annual calendar. Coaches should make every effort to contact their roster as soon as possible and communicate information regarding the first team practice or team meeting. How do I recruit help? Each roster provided to the coach will identify those parents that volunteered to be an assistant coach or a team mom.